Mary Catherine Jackowski is Christian Artist who lives in beautiful Northern Michigan with her husband Brian who helps her with MOHLOM. 10% of all sales go to the local area Right to Life and 50% of all the Card Sales go to them as well. Our products are hand crafted out of 100% Recycled Glass. The glass comes to us broken and dirty. We wash it, break and shape it and free form fuse it in a kiln. We do not use any molds, so each piece is uniquely organic in shape and texture. No two are alike, just like us!! It is fired in a kiln at 1480 degrees. My total fire time with ramp up, fire and ramp down is about 7-8 hours. Then the kiln is then shut off to anneal for 12-14 hours. After this time we can open the kiln and take out our pieces. We then clean up each piece and craft it into our various items. 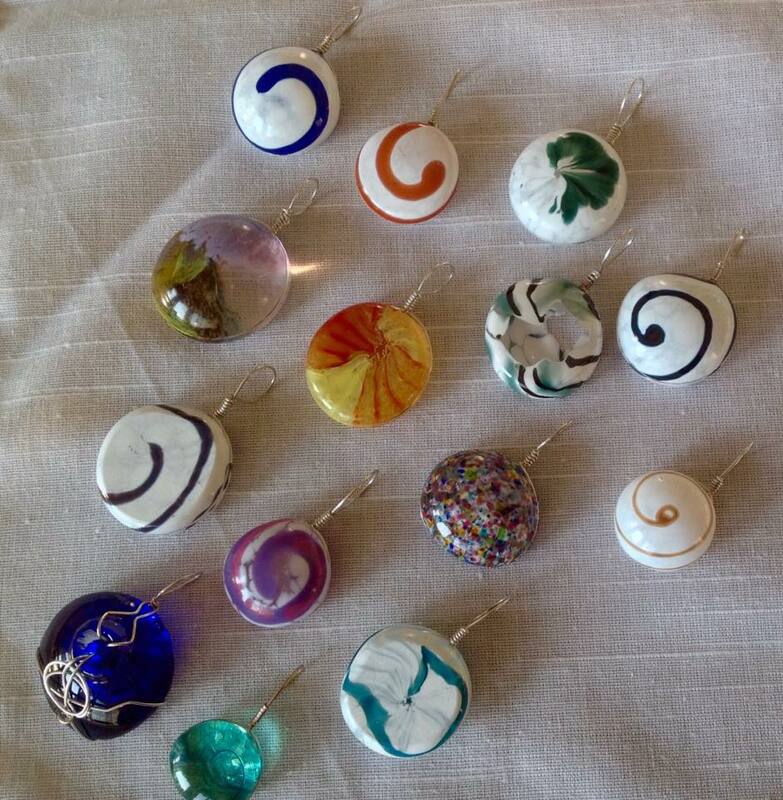 Some are wire wrapped for pendants with Argentium Silver. Argentium Silver is purer than traditional sterling silver; it is the color of pure silver. Brighter than platinum, white gold and traditional sterling silver. It has a longer lasting shine, high tarnish resistance means low maintenance silver. And it is responsible as it is produced using only recycled silver!! All our Ear Wires are hand made with our own custom designs, which stand out from other earrings you can buy. Some become nightlights, brooches, flowers, pieces for windows, cabinet knobs.....I am having so much fun!!!! Once the Kiln reaches 1480 degrees Fahrenheit it is then flash cooled by opening the lid. I then lower the heat down as quickly as possible and start my ramp down process. This is where I soak the glass at different temperatures for long periods of time. 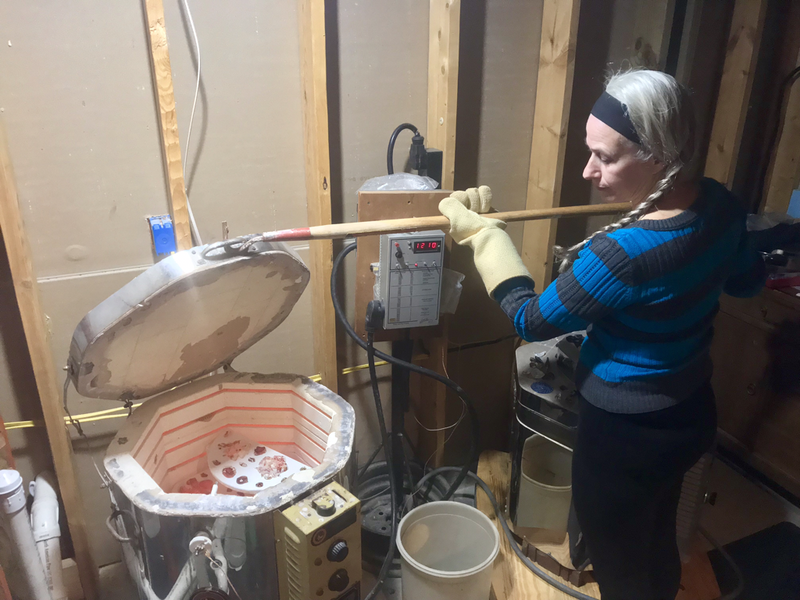 When I am done ramping down, I then turn off the kiln and do not open it for 12-14 hours. When Blowing Glass there is always some Glass left on the pipe once a piece is made. It is broken off and recycled. That is me at my Aunts studio when I was learning to blow glass! Some are wrapped with Argentium Silver. Or a bail is attached to the glass and then heated to bond it securely.